It's a tale of two 17 year olds on the Czech Republic's initial 41-man roster for the World Junior Championships. The player who is perhaps their top domestic hopeful is out, while a rising star currently playing in Canada is in. Championships. Photo: Pavel Vrtiška, hc-slavia.cz. Dmitrij Jaškin, who has 8 points in 23 games for HC Slavia Praha this season, injured his knee on Sunday when he was hit by Jindřich Kotrla of HC Vagnerplast Kladno in Kladno's 3-1 victory. Though no penalty was called on the play by the on-ice officials, the APK has handed Kotrla a three-game suspension for the knee-on-knee hit. At the club's website, www.hc-slavia.cz, coach Vladimír Růžička speculated that Jaškin would likely be out five or six weeks and return to the lineup in early January, at best. This would rule out participation in the WJC. Jaškin is currently the highest scorer among junior-aged players in the Extraliga, so his loss hurts. The 17-year-old made a strong case for his inclusion on the World Junior team a couple of weeks ago in a U20 tournament in České Budějovice and Karlovy Vary. There he was one of the offensive stars of the Czech team, recording a hat-trick against Russia in the tournament opener. 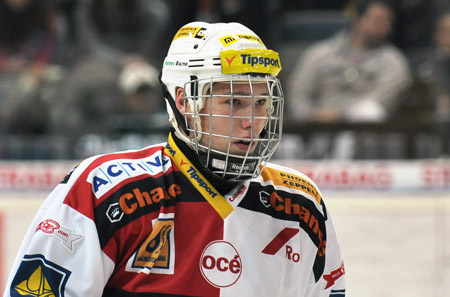 2011 will be the first year that he will be eligible for the NHL Entry Draft. Jaškin's spot on the preliminary 41-man roster has been replaced by Martin Frk, who plays for the Halifax Mooseheads of the QMJHL. The 17-year-old right winger has 10 goals and 19 assists in 26 games for the Mooseheads this season. His 29 points leads his team and also all rookies in the league. As his October 5 birthday is after the cut-off, he won't be eligible for the Draft until 2012, and the season he's having is starting to make his name mentioned among that year's top prospects. As for Slavia, they have suffered a rash of injuries as of late, and the loss of Jaškin only compounds the problems. They took to the ice without Jaškin on Wednesday night and, after spotting HC Oceláři Třínec a 3-1 lead, came back to win in a shoot-out. The comeback spoiled a three-goal effort from Třínec's Ladislav Kohn.